The Aye Aye is a species of Lemur that is found inhabiting the rainforests of Madagascar. The Aye Aye is not only the largest nocturnal primate in the world but is also one of the most unique and is in fact so strange in appearance, that it was thought to be a large species of Squirrel when it was first discovered. In the mid 1800s the Aye Aye was finally recognised as being a species of Lemur but was classified in a group of it's own as their closest Lemur relatives remain a mystery even today. 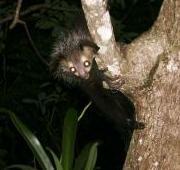 However, these incredibly unique animals are severely threatened throughout much of their natural habitat and were thought to be on the brink of extinction by 1980, primarily due to them being killed instantly by local people who believe that seeing an Aye Aye is very bad luck. Although today population numbers seem to have risen, the Aye Aye is one of Madagascar's most endangered animal species. The Aye Aye is a primate that is most closely related to Lemurs but is one of the most unique animals on the planet due the fact that it possesses a number of very distinct adaptations. Their body and long tail are covered in coarse, shaggy black or dark brown fur with a layer of white guard hairs that helps them to blend into the surrounding forest in the dark. The Aye Aye has very large eyes on it's pointed face, a pink nose and rodent-like teeth with incisors that grow continuously to ensure that they never become blunt. Their large rounded ears are incredibly sensitive giving the Aye Aye excellent hearing when listening for grubs beneath the tree bark and are able to be rotated independently. The Aye Aye has long and bony fingers with sharp pointed claws on the ends to help when dangling from branches, but it is the middle fingers on their front feet which are their most distinctive feature. Much longer than the others, these fingers are opposable with a double-jointed tip and a hooked claw on the end and are used for both detecting grubs in dead wood and then extracting them. Historically, the Aye Aye inhabited the coastal forests of eastern and north-western Madagascar but by 1983 they were thought to be almost extinct with only a few scattered individuals known to still be found there. Since then their population numbers have increased and although these populations aren't favourably big, they are found in an increasing number of locations and in a variety of different forest habitats. The Aye Aye prefers dense, tropical and coastal rainforest where there is plenty of cover but they are also known to inhabit secondary forest, bamboo thickets, mangroves and even coconut groves along the eastern coast of Madagascar. However, along with the persecution of the Aye Aye by local people they are severely threatened in their natural environment by habitat loss. 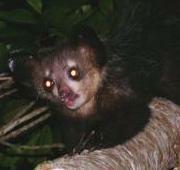 The Aye Aye is a nocturnal and arboreal animal meaning that it spends most of it's life high in the trees. Although they are known to come down to the ground on occasion, Aye Ayes sleep, eat, travel and mate in the trees and are most commonly found close to the canopy where there is plenty of cover from the dense foliage. 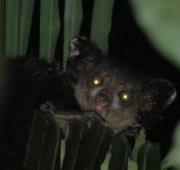 During the day Aye Ayes sleep in spherical nests in the forks of tree branches that are constructed out of leaves, branches and vines before emerging after dark to begin their hunt for food. The Aye Aye is a solitary animal that marks it's large home range with scent with the smaller territory of a female often overlapping those of at least a couple of males. Male Aye Ayes tend to share their territories with other males and are even known to share the same nests (although not at the same time), and can seemingly tolerate each other until they hear the call of a female that is looking for a mate. It was previously thought that the Aye Aye had a very strict breeding season (in the same way as other Lemurs) when they actually seem to breed throughout the year, depending on the when the female comes into season. When a female is ready to mate she calls to male Lemurs who are known to gather around her and will fight aggressively between one another for breeding rights. After a gestation period that lasts for about five months, a single infant is born and spends it's first two months in the safety of the nest, not being weaned until it is at least 7 months old. Young Aye Ayes will remain with their mother until they are two years old and leave to establish a territory of their own. A female Aye Aye is thought to be able to start reproducing when she is between 3 and 3.5 years old where males seems to be able to do so at least 6 months earlier. The Aye Aye is an omnivorous animal that feeds on both other animals and plant matter, moving about high up in the trees and under the cover of night. Males are known to cover distances of up to 4km a night in their search for food, feeding on a variety of fruits, seeds, insects and nectar. They are however specially adapted to hunt in a very unique way as they use their elongated middle finger to tap dead wood in search of the hollow tunnels created by wood-boring grubs, listening for even the slightest sound with their sensitive bat-like ears. Once the Aye Aye has detected it's prey it uses it's sharp front teeth to gnaw a hole into the wood before inserting the long middle finger, hooking the grub with it's claw and extracting it (filling the same ecological niche as a Woodpecker). The Aye Aye is also known to use this long digit to eat eggs and coconut flesh and is thought to be the only primate to use echolocation when searching for food. The secretive and tree-dwelling lifestyle of the Aye Aye means that it actually has very few natural predators in it's native environment, with the agile and equally nocturnal Fossa being their most ferocious natural predator (along with Birds of Prey and Snakes that hunt the smaller and more vulnerable young). Humans are in fact the biggest threat to the Aye Aye as populations have been obliterated in much of their native forests due to superstition from local people who believe that it is a bad omen to see one. 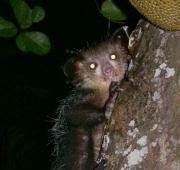 In other areas where they are not feared in this way, the Aye Aye is hunted as bushmeat. The biggest threat however to current populations is habitat loss caused both by deforestation and growing Human settlements that encroach on the Aye Aye's natural habitat. Although the Aye Aye is a solitary animal, males have very loose territories that can overlap those of a number of others. They build their nests high in the trees and will rarely sleep in the same one two nights in a row which means that one territory can contain numerous nests, with up to six thought to be found in just one tree. The Aye Aye is thought to be one of the creepiest creatures in the world with it's name believed to have come from the cry of alarm when a person spotted one. Despite now being found in more areas of it's once vast range, Aye Aye population numbers were once so low that they were actually thought to be extinct in the wild until 1957 when they were rediscovered. The main reason why Aye Aye population numbers have been critically low for years is that local people think that they are just too weird and many believe that seeing one is very bad luck indeed. One story says that if an Aye Aye points it's long middle finger at you that you will die, and other stresses that seeing one will lead to the death of a villager. The only way of stopping this in both cases is to kill the Aye Aye as quickly as possible which has led to the extinction of populations in certain areas. Today though, the Aye Aye is also faced with the increasing size of towns and villages that encroach on it's native habitats with some individuals forced to invade crops to get food, which often leads to them being shot. They are also severely threatened by deforestation for the logging industry and to clear land for the creation of agricultural plantations. Today, the Aye Aye is listed by the IUCN as an animal that is Endangered meaning that it is severely threatened from possible extinction in the near future. Numbers have increased somewhat since the 1980s and small populations have been sighted in more areas of their natural range however, they are still greatly threatened by the Human activity going on around them. A number of captive populations can be found around the world in breeding programs to try and save the Aye Aye from complete extinction. A small population can also be found on the island of Nosy Mangabe, which is a protected reserve just off Madagascar's north-east coast.